Like a personal trainer in a box, the Vivonic Fitness Planner helps youkeep track of your fitness goals, workouts, and eating habits. The system worksby first using Vivonic fitness software on your PC to assess your needs andgoals through a series of in-depth questions. With information about yourpreferences, schedule, regular activities, current exercise regimen, and medicalissues, you can then determine your fitness goals and how long you want the planto last. 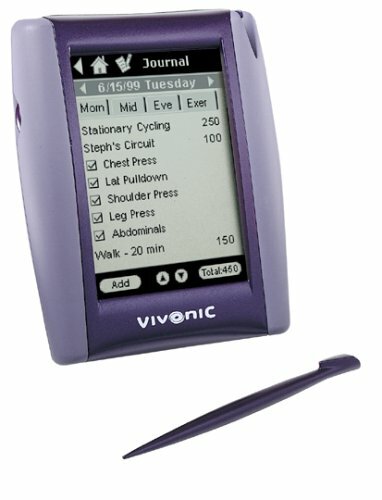 The Vivonic software then recommends a personalized workout withcomputer animations to help you understand unfamiliar exercises. Download yourplan from your PC to the Vivonic Fitness Planner, and you're ready to go. The Fitness Planner allows you to access exercise and calorie tracking programsthrough the touch screen interface. It tracks your sets, repetitions, weights,and even seat settings (for machine-based exercises). You can also easily addyour own foods into the database and view nutritional details of what you'veeaten. The planner gives you weekly totals of calories consumed, grams of fat,sodium, and cholesterol. The built-in pedometer tracks your walking or runningmiles. I purchased the product and and have repeatedly tried to contact the tech support line listed in the liturature by phone and e-mail with no response. I am very disapointed and the productr is unusable. What a ripoff. Like the other bad reviews I got my planner and it broke in as little as 2 hours. I took forever to get it to synch and then it just stopped working. I think I'll just get the Palm and try the software on that. What a complete waste of time! Can you say "Quality control issues"? Like the reviewer from Baltimore, I was psyched to enjoy this device. Not three hours after unwrapping it, though, and it's already dead. Got all of my meals from the past week logged in (I had been keeping track on paper in anticipation of receiving the gizmo), entered in all of my personal info, hit the journal key, and...nothing. Well, not nothing. More like 10 lines of gibberish on the screen. Did a soft reset. No change. Took the batteries out, put them in. Blank screen. I called customer support (and sat on hold for 10 minutes of a non-800 long distance call before I even spoke to a rep). Did a hard reset over the phone. Nothing. Again. Nothing. Finally, rep said they'll send a new one out to me. How do I send the old one back, I asked. "Oh, we're not doing that anymore," says the rep. "We'll just send you a new one and you can toss the broken one." Get the impression that this is more than just an isolated incident? So I'm getting a replacement device. Wonderful. And if THAT one fails, then what? Do they just keep sending me new ones every couple of days? In the meantime, I'm back to paper and pen. Here's some advice: For way less than what this device costs, you can pick up a discontinued Palm IIIxe from Staples.com. Get that, then order the Vivonic software for the Palm from. For LESS than the cost of the Vivonic handheld alone, you've not only got all the functionality of the Vivonic handheld device, but a Palm Pilot to boot. As a personal fitness trainer, a martial artist and someone concerned with caloric intake, I needed something that wasn't going to bog me down. This is a phenomenal machine that tracks anything I want it to! I found out that some foods I ate too much of and others too little. I also track the amount of cardiovascular time, weight increases/decreases, etc. I am really amazed by this product! It is worth every penny!